Happy faces everywhere at Diamond Lake County Park on a warm Tuesday in late July as a group of kids spent the day learning about fresh water and the life it supports. 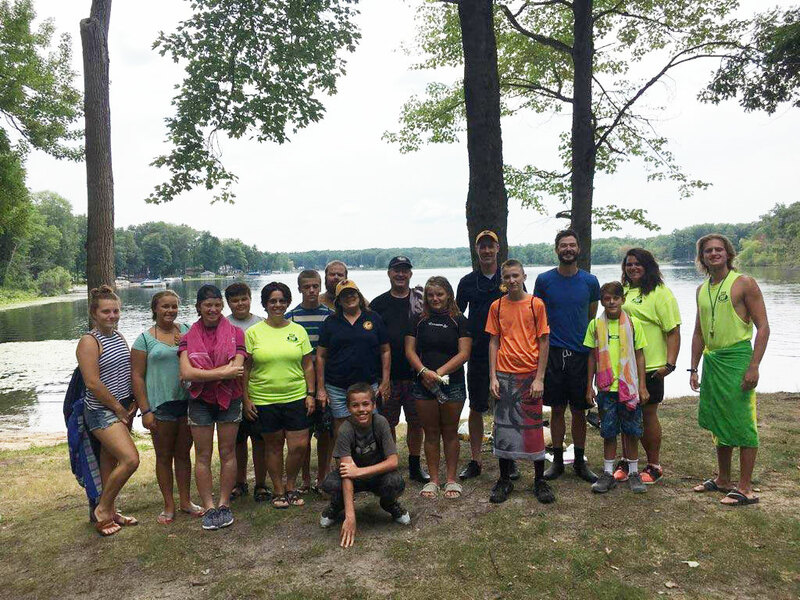 In an event sponsored by the Fremont Area Community Foundation and Newaygo County Parks, young people from the At Risk program at Newaygo County Prevention of Child Abuse and Neglect joined MRWA staff Marty Holtgren and Pat Jarrett at the park for an immersive experience. The day was made possible by great partners which included Erick Elgin from Michigan State University Extension, Nick Smith from Newaygo County Parks and Recreation, and Doug Harmon a certified Scuba Diver and board member of the County Road Commission. After Doug and Erick fitted the kids with snorkels and masks, they all waded in to explore the cool backwaters of the lake to learn about water safety, aquatic ecology and ecosystems. For most of the kids, it was the first time they had looked below the surface of the water and observed fish and aquatic plants in their natural environments. Doug and Erick took them into the nearshore habitats and deeper water and explained how the different fish species use a wide variety of habitat types. The group of young snorklers got close to Largemouth Bass, Bluegill and even a Northern Pike. A station was also setup to collect and identify the insect life found in the shoreline habitat. The kids were excellent insect collectors, and a few would be good candidates to be entomologists (insect scientist)! During the insect collecting we found a long, slender predator called a Water Scorpion, a Chaoborus or phantom midge, and plankton. The kids were hawkeyed and found more insects than we expected. After the day was done and pizza was devoured we all reflected on the great day and the excellent group of young people. As a final highlight, the kids were able to take home the mask and snorkel. This was important to MRWA and partners because we not only wanted to teach them how to enjoy the aquatic environment but also give them the opportunity to come back again and explore on their own. Thank you to the Fremont Area Community Foundation for providing funding! Also, thanks to Doug, Erick and Nick for donning the mask and snorkel for over an hour and providing such a unique opportunity.